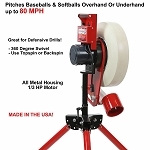 Softball Pitching Machine Discounts • Huge Selection • Free Shipping! 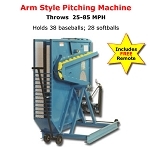 A softball pitching machine is one of the best training aids you can buy. 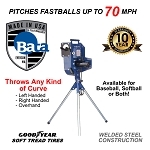 Practice hitting fast pitch or slow pitch softballs and work on your fielding skills, too, with our impressive lineup of softball pitching machines. 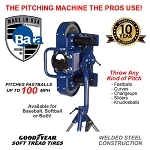 Featuring ultra portable Louisville Slugger softball machines, affordable Heater Sports softball pitching machines, incredible value First Pitch softball machines, pro-level BATA and Rawlings-Spinball softball pitching machines and the biggest name in the softball pitching machine game - JUGS Sports - we are sure to have the perfect machine for your game and your budget. 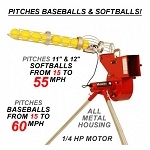 Whether you are looking for fast pitch softball pitching machines or slow pitch softball pitching machines, we've got them. In fact, most of these machines will do both! 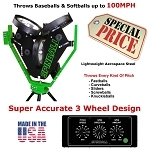 All of our softball pitching machines feature manufacturer warranties and free shipping. 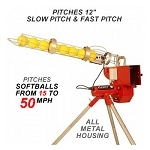 Below, you'll see our wide variety of softball pitching machines for sale. 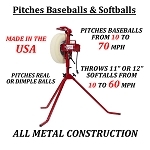 Be sure to scroll to the bottom of the page to see our softball pitching machine Frequently Asked Questions. 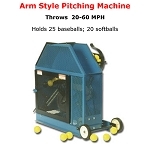 How Can I tell if it is a Fastpitch Softball Pitching Machine or a Slow Pitch Softball Pitching Machine? 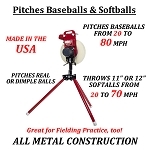 Really, there is no difference between a fast pitch or slow pitch pitching machine. To get a machine to simulate slow pitch, you simply aim higher and reduce the speed, which creates an arc to the pitch. More than anything, you should be paying attention to the maximum speed of the softball machine if you want to use it for fast pitch and you are using the machine from regulation distance. You can, of course, move the machine closer to the plate and the "seems like " speed will be much faster than what the machine is really throwing. To calculate the "seems like" speed, divide the shorter distance by the regulation distance and multiply by the speed. 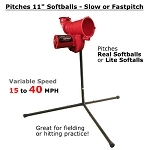 What is the Best Pitching Machine for Slow Pitch Softball? Every pitching machine made can throw slow pitch softball arcs. It's a matter of adjusting the speed and the angle of the pitching machine head to throw what in essence is a very slow "fly ball" that only travels 43 feet - a "bloop" in the 6' -12' height range. Where things become far more difficult is doing that if you plan on practicing solo. 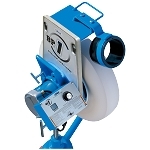 The vast majority of pitching machines are fed from the back and shoot out the front. It is impossible for those machines to use an automatic ball feeder because a ball cannot roll uphill into a pitching machine (it would have to be angled up to throw an arc). 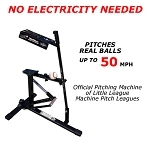 The only pitching machine capable of pitching slow pitch softball with an automatic ball feeder attached is the Heater Sports Real Softball Pitching Machine. It feeds from the side, so no matter what angle the pitching machine head is set at, a ball would never have to roll uphill after being released from the ball feeder. What Kind of Softballs Should I Use? Moreso than with baseball pitching machines, softball pitching machines are very hard on real softballs. That is because softballs have much thinner covers than baseballs do. If you try to use real softballs, expect to be buying a LOT of softballs because after only a few throws, the pressure of the wheels will rip the covers off of them. Consequently, you should only use dimpled softballs or realistic seam softballs made specifically for pitching machines. 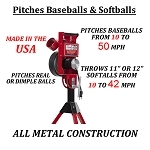 Pitching machine balls are built to handle the pressure exerted on them by softball pitching machines and last practically forever! No matter which brand of pitching machine ball you choose, they will last far longer and pitch more accurately than a real softball will. Which Home Batting Cage Should I use with a Softball Pitching Machine? The answer to this really depends on the pitching machine you buy, the skill level of the player(s) using it and whether or not you are using it for fast pitch softball or slow pitch softball batting practice. There are more than 60 home batting cages on this website, so we're sure that no matter what your situation is, we have the batting cage that will suit your needs. 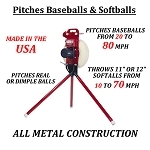 If you buy a Heater Sports 12" Softball Pitching Machine or the Heater Sports Combo Baseball and Softball Pitching Machine, for instance, they have a harness on those machines specifically designed to be used with one of their Xtender Batting Cages. If you pair a Heater Sports pitching machine with one of Heater's batting cages, the machine clips to the OUTSIDE of their batting cage, meaning that you won't have to worry about purchasing an L-Screen to protect your pitching machine. 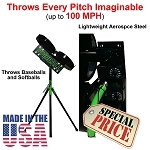 If you buy any other brand of pitching machine, you will definitely want to put it inside of the batting cage and protect it with an L-Screen. If the hitters using the pitching machine are older and hit with real power, a #24 net may not be strong enough to withstand line drives - particularly ones pulled or pushed into the net close to the hitter. If that is your situation, you'll probably want to get a #36 or #42 Cimarron batting cage net, which not only endures powerful line drives better, but they also hold up better in inclement weather (although we highly recommend taking down nets during storms so that your whole batting cage does not get blown over and damaged). Pay particular attention to the height of a batting cage if you plan on using it for slow pitch softball hitting practice. You'll obviously never be able to get close to a 12 foot arc in a cage that is only 10 ft. high. For that reason, Cimarron Sports Batting Cages, which are 12 feet high, are usually better cages for slow pitch softball batting practice. 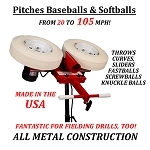 Can a Softball Pitching Machine Be Used With an Automatic Ball Feeder? How Many Softballs Will They Hold? 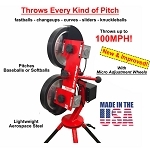 Most of the pitching machines sold on this website can be used with a ball feeder made specifically for it. The exceptions to that are the Louisville Slugger pitching machines and the First Pitch Relief Pitcher, which DO NOT have ball feeders made for them. Here are the number of balls that each brand's ball feeders will hold. Please Note: Automatic ball feeders always work better with dimpled softballs. They roll much more smoothly and feed into machines better than real softballs, which have seems that sometimes get hung up as they try to roll down a feeder chute. 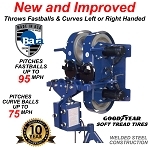 BONUS BALL FEEDER DISCOUNTS: During limited time sales, many of the pitching machines on this website have bonus discount coupons in the "Product Highlights" section, just above the Add to Cart button. 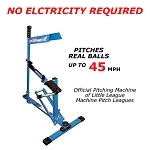 If you add a ball feeder as an extra on the pitching machine product page, any discount percentage applied to the pitching machine also apply to the add-on ball feeder. If you add an automatic ball feeder as a separate line item by purchasing it from the accessories page, you won't get that extra discount. 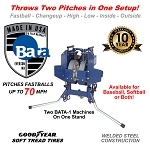 Which Softball Pitching Machine Should I Buy? Really, there is no set answer for this question. 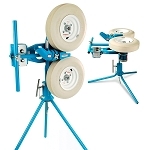 Different families have different needs when it comes to pitching machines. How many years you expect the machine to be used, how many people might be using it, where you plan on using the pitching machine, the age group who is using it and whether or not you need it to throw drops and curves all play a factor. When in doubt, definitely check out our article that addresses what the Best Pitching Machine to Buy is. It will help you decide what the most important things are for your family and aid you in narrowing down your selection of the perfect ball machine.